When you live in a small house, it's great to find places that can serve more than one purpose. Remember my dining room closet that had many layers of wallpaper? That closet normally holds my vacuum cleaner, a few vintage suitcases that act as storage, a few coats, and my freshly laundered shirts until I have time to iron them. And remember my post on Wallpaper in Your Closets? Well, when I did that post, I already had something up my sleeve. 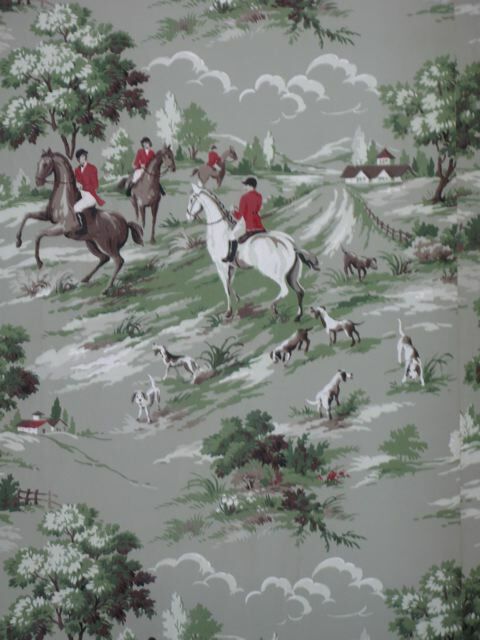 I fell totally head over heels for this 1940s Fox Hunt wallpaper. I don't think we had this exact print but I remember the den in my childhood house having wallpaper similar to this. I was lucky enough to snag the last double roll of this fun print. And I've been champing at the bit (pun intended) to find the time to finish this project for a few months. 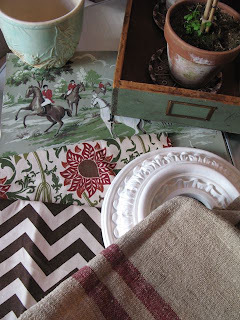 I had assembled a bunch of things as inspiration for the dining room a few months ago but I couldn't show them because it would have given away the surprise of the wallpaper. First, I had to trim off the selvage edge. When my grandfather taught me how to wallpaper, I remember that we used to overlap the edges, but I don't recall him trimming these off. Perhaps he spared me the agony. I used my four-foot level as a straight edge and a razor blade to carefully trim off the edges. Thankfully I only needed only three strips. What a pain! I can't imagine trimming enough wallpaper for an entire room. ...and book the wallpaper to let it absorb into the paper for several minutes. The smell of the paste and the wet wallpaper took me right back to an eight-year-old boy wallpapering the downstairs bathroom with my grandfather. I don't think I've experienced that smell since that time. It's amazing how an odor can be so instantly connected to a memory. It was tough working with this old paper, probably due in part to the paper's fragility after 60 years. I ripped the first piece but since it was off to the left of the door, I pieced it back together and prayed the glue would hold it tight while it dried. It did. The other two pieces went pretty smoothly. The whole thing took about two hours. The wallpaper is still wet but I couldn't wait to start setting up the closet. I took the bench from my bedroom upstairs and stacked the vintage suitcases. I love how the original paint on the upper shelf pretty closely matches the color of the bench. One of suitcases holds files, papers, bills, receipts, tax documents, etc., and the other holds hats, gloves, gloves and umbrellas. I've recovered the bench with a brown plaid RL fabric. I was planning to use the vintage box on top but when I went shopping today, I found the perfect tray. And here's the final product. Since I don't have the space for any kind of sideboard or serving table in the dining room/study, the closet is the perfect place to set up a little bar when friends come over. I'm really pleased with how this turned out. The wallpaper seems perfectly at home, like it's been there for many years. And I think it's the perfect little surprise that makes a house unique. I had a lot of fun doing this...and it's another project I can cross off the list. Love it. It's like a little sneaky surprise. A whole room may have been too much....this is just enough. I had a memory flash brought on by a scent too. I was staging a house and my assistant brought along several bars of soap she had purchased at a dollar store for the bathroom. They were Imperial Soap, the kind my Granddad always used. I dissolved into tears when I smelled it. I loved the smell of my Granddad. Thank you for a lovely post. This is fabulous. Take the door off! This little nook should be on permanent display. Love that wallpaper! So blue blood. Well, I'm sitting here again with my jaw to my chest. In a word fantastic. Love the vintage paper, suitcases and the glasses. Great job Steve. I love this wallpaper, it is like artwork in the closet. I have hung lots of wallpaper but I never did have a roll that needed trimming on the side, I have seen that in fabrics. Did you wallpaper the sides of the closet or just the back panel? Scent is a memory trigger! Wow! I really love the way you think. Great job! It's gorgeous - I love it, and especially that you know the old-fashioned art of wallpapering. I love all those gracious skills of bygone days! The paper is delightful. So timely - we were just rewatching Season 1 of Downton Abbey tonight (have you seen it?) and "the hunt" is mentioned and portrayed so beautifully. I covet your ice bucket. Perfect, all. As you say, you have created the perfect little surprise. I have also used wallpaper to decorate the inside of a pale grey cupboard and people are, indeed surprised when they see the interior. However, I would say that you have actually created a double surprise because your very smartly presented drinks tray must be the icing on the cake. Wow! That tray is just perfect for the space. I thought you would have to search for awhile to find something. I love this as a bar area. 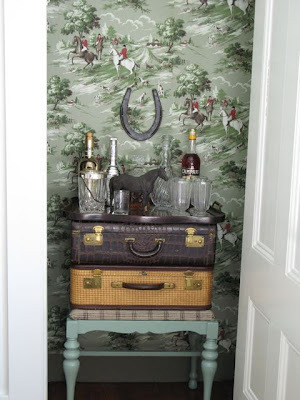 Love the surprise of the wallpapered closet. When you mentioned the smell of the wallpaper taking you back to a time with your Grandfather...just the mention of this brought back the smell to me and when my Mom papered our dining room. Yes, a distinct smell with happy memories attached. I love this little surprise in the room. That horse statue is just right too! What a labour of love! I hope you lift a glass to your grandfather every time you use it. p.s. I'm on the lookout for a fox and hounds type hunting picture here in England...have seen some fantastic examples in old pubs! What a unique idea! Just the kind of thing that makes a home personal. I love it! I love this closet idea Steve!! You have such nice taste, it totally looks vintage and like a RL advertisement!! Beautful job, love the horse shoe. I am in love!!! It looks great! I don't think I could ever close that door if that space was in my house... I would just open it and admire it. It looks like it's been there forever. It's amazing what you can accomplish in a few short hours, and what an impact it'll have how you enjoy tour home. A wonderful example of small house living. Is there a light in the closet? You are my dream man, this is fantastic. 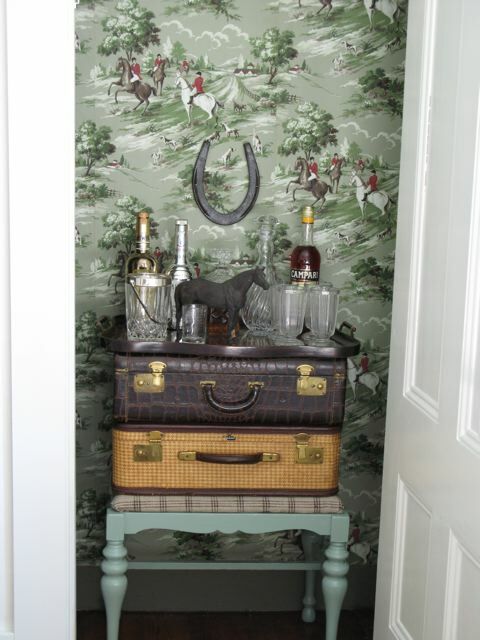 First because I love the look of a wallpapered closet. Second because you used vintage wallpaper and were able to do it yourself. Third, the suitcases, the horseshoe, the tray, perfect. Fifth, because you shared that sweet story of your Grandfather. Thank you again Mr. Renaissance Man. Helen, I just did the back. There's ductwork that goes to the upstairs on both sides and I painted that to match. MelD, Not sure. I found it at the antique shop. It does seem big. AM, No, no light. But that would be pretty cool. To all those who said to leave the door open or off, If I can add some closet space elsewhere in the house for coats, etc., I would definitely do that. This is unfortunately my only closet downstairs other than the kitchen pantry. Jane, Flattery will get you everywhere! Oh, I love it! 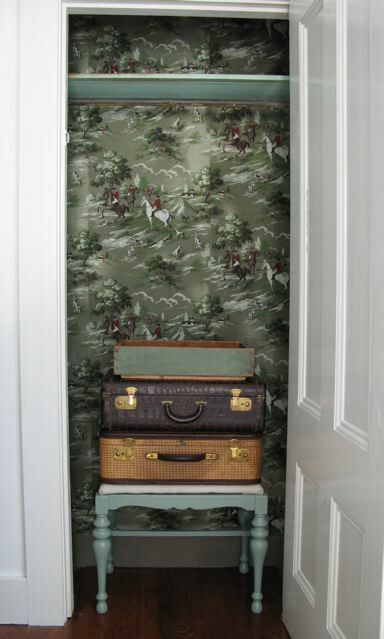 The vintage wallpaper is so wonderful and your idea to use it on the interior of the closet was inspired. 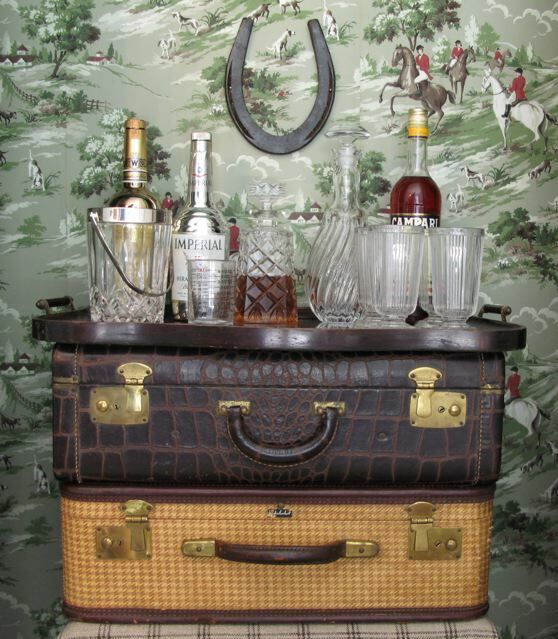 The suitcases, the tray - all if it - create a great look for entertaining. That's a perfect ensemble of crystal decanters and O! that ice bucket!!!!! I love the horse and I can't believe that tray fits so perfectly. The colors are all so good together. I'm with Jane. You can do it all! I have like 153 things to do and all I WANT to do is search online for wallpaper, go thrifting for suitcases and paint a little bench I have! Seriously though, this is SO amazing and I'm in such awe. I have a closet at the foot of my stairs that is hardly used yet is crammed full of coats and blankets! Now I must empty it out and make it beautiful. Now that's pretty cleaver! 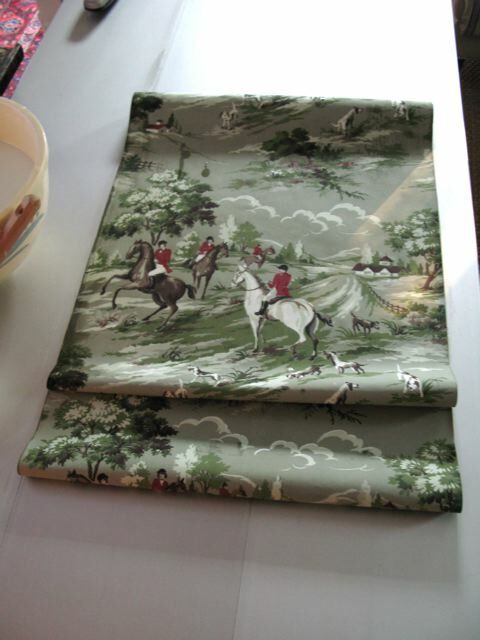 I love the wallpaper and the dining room inspiration! And...you iron your shirts...now I'm really impressed! If it weren't for dry cleaners I'd always be wrinkled! Genius. That wallpaper totally makes over the closet. I want to snuggle up in there. Great idea about the bar area. Out of the way and so unexpected. What can I say? This is so totally fabulous with the beautiful wallpaper and set up for a nice little bar. 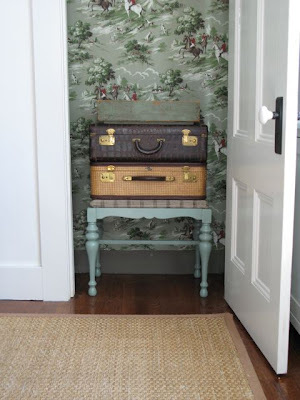 Great idea to use vintage suitcases as storage and display. You must leave the area open! 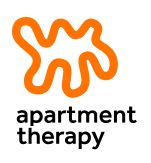 Find someplace to add another closet for coats etc... This is just too wonderful to hide. I think you're in the wrong business Steve! 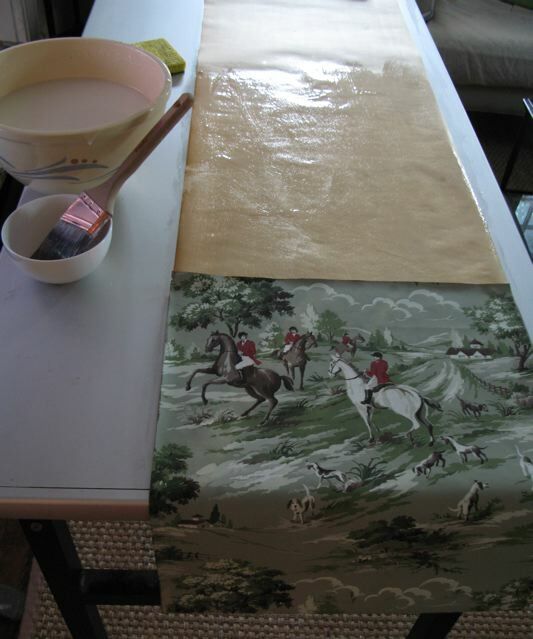 I love it, I can remember that paste smell too, my mum was always wallpapering when I was a kid. You secret closet is Sassy approved! Love, love, love that paper. 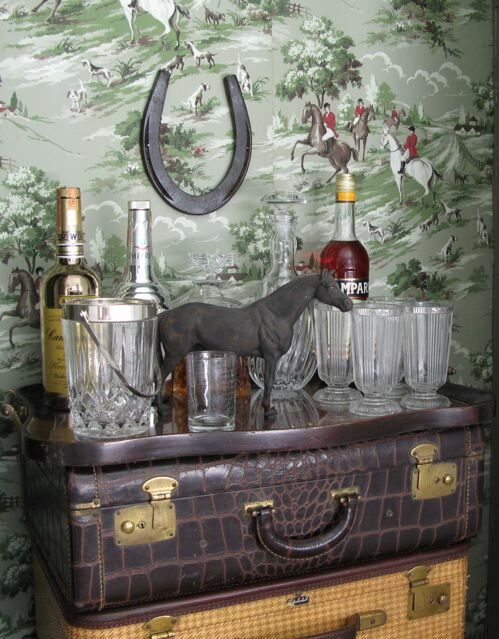 Great idea making a bar area in the closet and I love how you accessorized it. That paper would be perfect in my sitting room. Dayum...That would make me stay in the closet! Campari cocktails for all...meet in the closet! Lurve the horse shoe and the ole brass horse. The wallpaper is fantab! You just need a pair of vintage field boots, and you are good to go! i still say take the door off, buy hooks and display your brilliance! Oh, you are just too wonderful for words. This is great :). i totally love this. so ralph. i'd park my riding boots right there. Love, love, love that wallpaper. 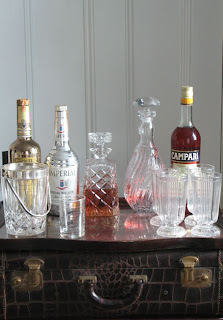 And what a great idea to use your small closet as a mini bar. I've always wanted a gentleman's club room, just love that look with hunter green shades. 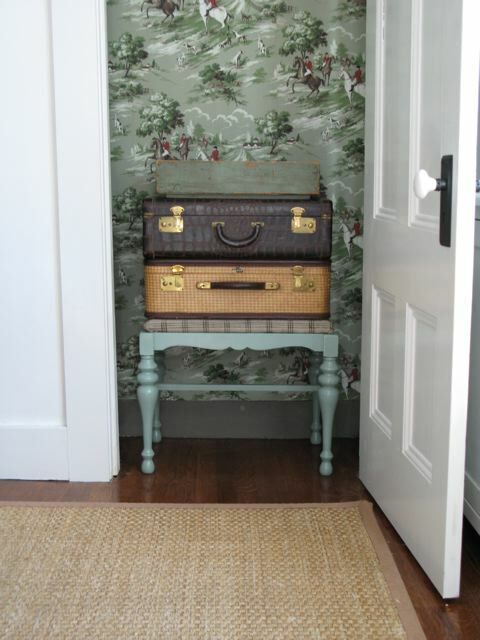 Love the vintage suitcases for storage. I use them for storage too. I like military trunks for storage as well. What a fabulous idea, and so professionally executed! Thanks for the inspiration. this is totally genius and a step above perfection. I would be blown away if I was at a dinner party and the host opened a closet like this! I'd have to fix myself a double! LOVE it - but what about lighting? just curious - is there a light at all? could be an opportunity to do something unexpected like an small but modern under-shelf mount for mixing drinks , looking for paperwork etc. charming, charming, charming with a capital "C"!!!! love it and love that it reminds you of your childhood home. isn't that crazy how smells will do that, had that happen last week myself (not with wallpaper paster however;)Can not believe you know how to wallpaper AND iron shirts- wow! you are a force my friend!! p.s. have you considered posting your photos in "extra large"... hint, hint!! You are the flippen bomb! Love the vintage wallpaper...and yes I am old enough to remember paper like that. Rats. You staged it just right and if you put some little wheels on that stool you could wheel it in and out when you need!!! God, I love a good vignette! A gin and tonic please. I second everything flwrjane said. I do have one question...Are those windows above the shelf in the first photo? If so, what did you do with them? They do sort of look like dirty old windows. They're old scratched up tin document boxes. Makes me think it would be cool to have a transom window in there though. Gorgeous, Steve! Gorgeous!! 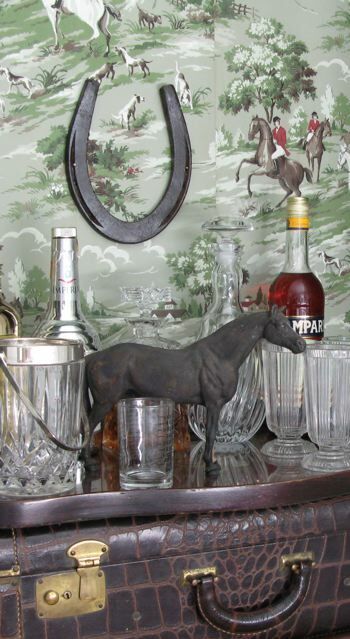 I love that wallpaper, and the horseshoe and horse statuary are such perfectly appointed accessories! Slayed. This is just an amazing use of space and such a creative project. 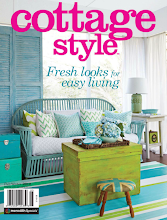 Love your site......love your style!!!!!! What a great idea! I love the wallpaper, and you could also use it for a mini writing desk area. I always look forward to your ideas. May I ask how you had the zinc top added to your dining room table? Thanks. Thanks for the information, particularly the heads-up about the cat pads. I suppose with enough pad prints it could become interesting. My cat doesn't get on the table (that I know of :)), but that is good to know...also about the Bar Keeper's Friend. Hey, that would be one way to find out if he DOES get on the table! Busted! Steve, I've never commented before but I love your blog and I LOVE what you're doing with the house. We used to live in East Cambridge (maybe again one day if we return to our home hemisphere) and you're living my dream. I was wondering what resources you use (besides census records) when researching styles/eras/furniture etc. You seem so knowledgeable about what everything is, what's appropriate, etc. I'd love a recommended reading list (be it blog or book). I love that you are not only stylish, but that you care about what is historically appropriate. I've just spent a happy half hour catching up on your last couple of posts - love what you've done with that little cupboard in the dining room - my childhood home had similar paper in the dining room, but rather than that luscious green it was what you might call puce! Your kitchen is looking great on a tiny expenditure and I like what you have planned for the double decker back porch too -waiting to see more! BTW the funny looking shears are for shearing sheep. Well this is about the most interesting and rewarding project I have seen in a long time. You've made a spare room out of a closet...how cool is that? I love every single detail. The vintage suitcases on top of that wonderful bench that looks like it was made for that space and the the perfect tray to sit on top..and look at that bottle of of Campari just sort of matching the red coats on the wallpaper. I can practically smell the wallpaper paste from here! Hi Steve, That is what I call a hands on job. It looks great and practical at the same time. Style, style, style you got it. What I love about you you do it yourself. Keep up the good work. Whats going on in your garden, did I miss a post? Love you interpretation of this space. Who would think to make a little closet a bar? It's really unexpected. Also, I haven't paid a visit to your blog in a while; your header is fabulous! Looking great Steve! Very clever. You have such a lovely blog!Love the horses! We look forward to future posts. Have a wonderful day! oh so fun. I love the paper and your creativity, but I'm also laughing reading your blog, such a great read. This is the ultimate in double duty!!!!! What a great idea! I always try to make covert spaces serve more than a single purpose, and I really admire when others do it so well!!! I am fumbling over ideas right now on how to make our laundry closet (too small to call it a room!) turn double duty as a butler's pantry. It would sure make life easier around here! I think it's going to boil down to getting a stackable washer and dryer to free up more wall real estate to add a sink. Oh, woe is me! Woe is me!!! YOU, on the other hand, have the talent and the skill to get 'er done! 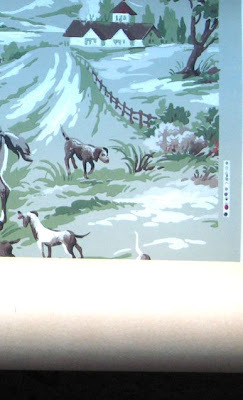 (Seriously...who else on earth who doesn't do it for a living knows how to work this skillfully with wallpaper?!??!!) Well done! Oh...and I LOVE the pattern!!!!!!!! could you tell me more about this wallpaper. Who made it and where did you get it from? Unfortunately the paper didn't have the name of the maker anywhere on it. 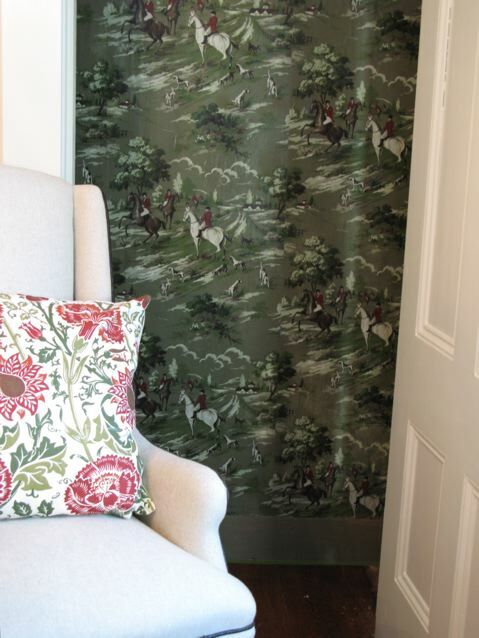 It came from either Rosie's Vintage Wallpaper or Hannah's Treasures, both sell vintage wallpaper on the internet. could you tell me more about this wallpaper? Where you got it and who the manufacturer was? Doors and Windows of Salem, Mass.